Marina Center is conceived and designed with the Eureka community foremost in mind, and it requires a large retailer as an anchor store to make the project economically feasible. Security National Properties carefully considered companies whose core values focus on contributing to the communities they serve, and who allow for differences in store design to reflect the unique character of each community and its surroundings. Security National Properties also carefully selected an architectural firm with extensive experience in aesthetically redeveloping blighted urban property to productive use. 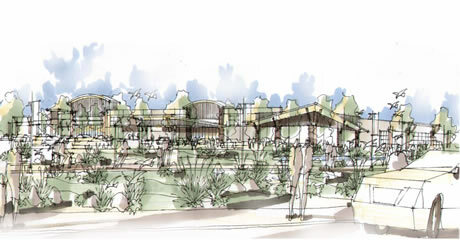 The partnership between Security National Properties, The Home Depot® and Baysinger Partners Architecture resulted in a design for Marina Center that reflects the small-coastal-city character of Eureka while bringing much-needed economic stimulus to the city and a viable solution for the Balloon Track brownfield. Large retail stores comprise only 25 percent of Marina Center; the remaining 75 percent is dedicated to smaller retail, restaurants, offices, The Discovery Museum, and affordable housing. Architectural and site design includes landscaped spaces with walking paths that connect with downtown and the surrounding community, and subdued storefronts inspired by the character of the environment and the proximity to Eureka Bay. Marina Center’s anchor store, The Home Depot, is one of America’s most successful companies. It is also considered an enlightened corporate citizen by the communities where it conducts business. With company values including “Taking Care of Our People,” “Giving Back to Our Communities,” and “Doing the Right Thing,” The Home Depot dedicated to providing innovative and industry-leading benefits, and makes benefits available to all full-time and part-time associates. The company offers medical, dental, and vision insurance; life insurance; the opportunity to share in the company's growth through its Success Sharing program - a bonus plan for associates; a discounted stock purchase plan; and other benefits to eligible full-time and part-time associates. Approximately 65 percent of its employees are full time. The Home Depot has entered into several hiring partnerships over the past few years in its efforts to recruit talented and diverse associates, including one with AARP. This partnership began in 2004 to attract, motivate and retain eligible older workers as part- and full-time associates. The Home Depot sends business to local contractors through its Installation Services business. The Installation Services business is an important part of the company’s outreach to “do-it-for-me” customers and engages local contractors providing business to them at no cost. The Installation Services business continues to see double-digit growth, especially in categories such as HVAC, kitchens, countertops, windows and roofing/gutters. Along with the other companies in the Marina Center, The Home Depot will contribute its share of an estimated $900,000 in property taxes and more than $1 million in annual sales taxes to benefit Eureka and its public services including schools. In addition to hundreds of good-paying jobs with benefits, The Home Depot’s social and corporate responsibility, commitment to the environment and economic contributions will benefit Eureka in many important ways. Giving back to the communities it serves is a fundamental value of The Home Depot and its associates. In addition to offering financial support to nonprofit organizations, the company also volunteers time and resources through Team Depot, The Home Depot’s organized volunteer force of associates who volunteer their free time to community projects. Team Depot gave nearly one million hours in 2005 while working on community service projects. The Home Depot is a network of stores, just like virtually all “local” hardware stores are either Ace or True Value stores. The Home Depot, as do Ace and True Value co-operatives, buy in quantity, and pass the savings on to their customers locally. The Home Depot will compete locally for business, but competition creates more options for the local community and ultimately benefits the consumer. The Home Depot is sensitive to the environment. It builds energy-efficient stores that comply with ENERGY STAR® guidelines guidelines and holds the 2006 ENERGY STAR® Partner of the Year Award from the U.S. Environmental Protection Agency. It selects lumber suppliers committed to sustainable forestry, giving preferential treatment to suppliers of certified green lumber products. Unlike most large retailers, The Home Depot custom-designs each store for its specific community and location. The current concept for the Marina Center store includes its newest store format incorporating high architectural and landscaping standards. As a member of the U.S. Green Building Council (USGBC) and a voting member of the Retail Committee, The Home Depot is applying its experience to aid in the development of an application guide that assists retailers in obtaining LEED certification for their buildings. The companys experience and commitment has also led to the development of stores that minimize energy use, have more permeable surfaces than in the past and make better use of existing development.